Background: October 14, 2011, President Barack Obama announced he was sending 100 troops to Uganda as advisors in locating and defeating The Lord’s Resistance Army (LRA). While to those unfamiliar with the LRA this might have come as a surprise, it bears noting that — in a show of unity remarkable for this congress — a vote to provide aid to Uganda against the LRA was unanimous. Twice. Joseph Kony, leader of the LRA, is charged with war crimes by the International Criminal Court, including murder, sexual enslavement, cruel treatment of civilians, and the forced enlistment of children into rebel ranks. The LRA continues to terrorize the region long after the Ugandan civil war ended in 2006. 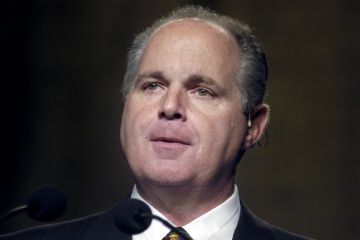 LIMBAUGH: Have you ever heard of Lord’s Resistance Army, Dawn? How about you, Brian? Snerdley, have you? You never heard of Lord’s Resistance Army? Well, proves my contention, most Americans have never heard of it, and here we are at war with them. Lord’s Resistance Army are Christians. It means God. I was only kidding. Lord’s Resistance Army are Christians. They are fighting the Muslims in Sudan. And Obama has sent troops, United States troops to remove them from the battlefield, which means kill them. That’s what the lingo means, “to help regional forces remove from the battlefield,” meaning capture or kill. So that’s a new war, a hundred troops to wipe out Christians in Sudan, Uganda, and — (interruption) no, I’m not kidding. Jacob Tapper just reported it. Now, are we gonna help the Egyptians wipe out the Christians? Wouldn’t you say that we are? I mean the Coptic Christians are being wiped out, but it wasn’t just Obama that supported that. The conservative intelligentsia thought it was an outbreak of democracy. Now they’ve done a 180 on that, but they forgot that they supported it in the first place. Now they’re criticizing it. So… keep in mind now what Limbaugh says above. He claims the LRA is Christian, that it is fighting Islam, that President Obama’s objective is to destroy this army, and that the 100 individuals being sent by us are going to kill LRA members. Further, he claims mystification as to why we would involve ourselves fighting such a morally upright group, the LRA sounding by the time he’s done not much different than George Washington and his troops about to cross the Delaware. Limbaugh is not merely an untruth teller here. I assert he is a liar. Here’s why. Realize that in five minutes, he could have researched using the web to disprove every allegation he makes above. But that’s not all. He *did* do research, enough so that he was able to quote documents he says are from the LRA. Those documents are much harder to find than the massive amount of horrific evidence against the LRA one finds instantly when doing any web search using any major web search engine. And then ask yourselves… when will his listeners make him accountable? How can we make him accountable? More on that at article’s end. Here’s the truth about The Lord’s Resistance Army. Be warned that some of what follows is very hard to stomach. The LRA began in 1987 during a time of civil war in Uganda. They are led by one Joseph Kony (more on him momentarily). They have kidnapped an estimated 66,000 children over the past two decades. They train the children to fight by mutilating those who refuse (shearing off lips, ears, and fingers the popular methods), and the new child soldiers are also forced to kill others (including children deemed too weak or too small, or children who attempt to escape). Kony, 41, envisions an Acholiland ruled by a warped interpretation of the Ten Commandments. He uses passages from the Pentateuch to justify mutilation and murder. He promotes a demonic spirituality crafted from an eclectic mix of Christianity, Islam, and African witchcraft. Any resemblance to these religions is superficial: While the army observes rituals such as praying the rosary and bowing toward Mecca, there is no prescribed theology in the conventional sense. Kony’s beliefs are a haphazard mix from the Bible and the Qur’an, tailored around his wishful thinking, personal desires, and practical needs of the moment. Jesus is the Son of God. But instead of saving the world from sin through his sacrificial love on the Cross, he is a source of power employed for killing those who oppose Kony. The Holy Spirit is not the Divine Comforter, but one who directs Kony’s tactical military decisions. Despite dabbling in the Bible and the Qur’an, Kony’s real spiritual obsession is witchcraft. He burns toy military vehicles and figurines to predict the course of battles from their burn patterns. He uses reptiles in magic rituals to sicken those who anger him or to detect traitors in his midst. He claims to receive military direction from spirits of dead men from different countries, including Americans. He teaches that an impending apocalypse will usher in “The Silent World,” where only primitive weapons, such as machetes and clubs, will bring victory. According to various sources, an incredibly high percentage (some say 90%) of the LRA’s force is made up of these kidnapped and brutalized child-slaves soldiers. I admit that after many years of listening to Rush Limbaugh tell untruths — untruths he could have corrected simply with five minutes of research — I am less optimistic than Evelyn. I don’t think Limbaugh will stop lying… and I call it lying because he has persisted despite repeatedly having his “facts issues” pointed out to him. He is appealing to a certain audience, an audience that keeps him wealthy (a reported $33 million per year) and offers him a sense of power. TURN OFF RUSH. And tell your friends, esp. those who call themselves Christians, that if they continue to listen to Rush they are exposing themselves to lies…. Lies which are comforting to them. Ask them why those lies comfort them. Ask them who is the Author and Father of lies. This is not about politics. I may vote one way on election day, others another way. But this is about truth-telling. Rush has failed the test. UPDATE: As of October 22, Limbaugh’s website still carries the transcript with the lie contained even in its title: “Obama Invades Uganda, Targets Christians.” Not only is Mr. Limbaugh a liar, he apparently is an unrepentant liar even in the face of worldwide exposure. What Mr. Limbaugh is saying not only about facts, but also about his faith in his audience to ignore facts, cannot be overstated.